I have been taking classes at the KORA Russian Language Institute for a week now and I LOVE IT! I am taking six subjects, which are all taught in Russian: Grammar, Russian Literature, Russian History/Historical Linguistics, Russian Phonetics, Speech Practice, and Mass Media, which consists of reading and presenting on Russian news articles. Each of my teachers is excellent and clearly loves his or her job. On Saturday, we signed our language pledge, which entailed that we speak only Russian on campus, on excursions, and with our host families. This has been one of the most frustrating, yet exciting challenges I have ever undertaken. Like I mentioned in my last post, now that I can only speak Russian, I realize just how little I know. But at the same time, I am astounded by the improvement in my listening skills after only being here one week. I have been pretty hard on myself this week after realizing just how far I have to go before reaching fluency, but as I reflect on my short time here, I feel encouraged when I note the many small linguistic victories I’ve had. I’ve asked for directions and actually understood the person answering me. I have been able to understandwhat is going on in my classes. I’ve been able to (for the most part) understand tour guides, teachers, and my language partner. Yes, my victory for the week has definitely centered around understanding. No, my tongue still doesn’t want to cooperate, but I am encouraged as every day the world around me opens up more and more as I adjust to the cadence of a new language. In addition to classes, we’ve been given the unique opportunity of working with a Russian language partner, someone our age who helps us with our language on a more informal basis. I have had such a great time so far with my language partner, Alyona. Alyona worked in America last summer through a Work and Travel Program and shares my love of peanut butter and Dunkin Donuts. 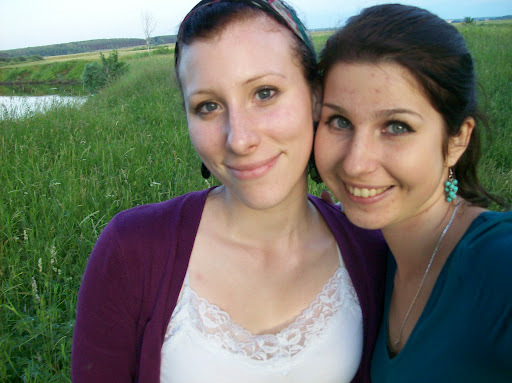 Last week, she and her friend Zhenya took me on a picnic in the beautiful Russian countryside outside of Vladimir. So far, this is one of my favorite parts of being here, and I’m really looking forward to getting to know Alyona and her friends better. Finally, today we went on an excursion to my favorite church in all of Mother Russia, the Church Pokrova Na Nerli. Built in 1165, this church is rich with generations and generation of history. 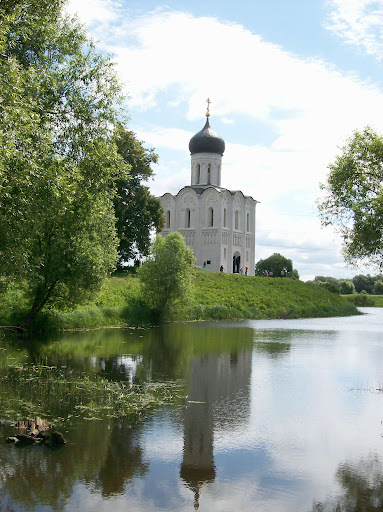 Set in the unspeakably peaceful, pristine Russian countryside, it has a magical feeling that speaks of centuries past while seeming frozen in time. This first week in Vladimir has been challenging and exciting, and I can’t wait to see how the rest of the summer unfolds. Da Svidaniya! Forgive my lack of creativity; after attempting to speak in Russian for three days straight my mind feels quite drained of any creative arrangements of words. Nonetheless, I’ll try to paint as good of a picture as I can of the place I will call home for the next eight weeks. When we landed in Moscow, it was the first time that Russia has seemed “normal” to me. Every other time I’ve touched down in the Motherland I’ve been filled with a sense of awe and extreme consciousness of my own foreignness, but this time, nothing really phased me. The stand-up toilets, drivers who count traffic laws as mere suggestions, and the constant buzz of the Russian tongue were no longer novelties, but an expected part of everyday life. I’ll be honest, when the “normalness” of Russia hit me, at first it was a bit of a letdown. Somehow, I knew that the nine year honeymoon phase I’d had with the vast country was over, and in my jet-lagged exhaustion, I was unable to realize that, like in a strong marriage, the end of infatuation has the ability to open the doors to a deeper love filled with knowledge, faithfulness, and depth of insight. When our motley crew of Americans boarded the bus, we immediately started to talk in Russian, which was all at once exciting, intimidating, fun, and extremely frustrating. It was about this point that I began to realize just how little Russian I really know! I am truly impressed at the level of Russian of my group mates, and now that the tiredness has worn off, I am extremely excited to learn with them and from them during the next eight weeks. By the way, my group is awesome, and I’ve already made some great connections with many people! We are a group of 28 students from all different educational and language backgrounds, but we all have in common a love for the Russian language. This is the first time I’ve been around other students who are very serious about becoming fluent in Russian, and it felt very strange indeed to begin to talk with fellow Americans only in Russian. We will all be attending Tsentr Rustiki Kora 5 days a week, a language school which is celebrating its 21styear. Our group of 28 will be split into 5 group based on our level, and yesterday we took a placement test, which, by the way, was the hardest test I’ve ever taken in Russia! After the test, I jokingly said to my classmates, “Cейчас знаю что ничего не знаю!” (“Now I know that I don’t know anything!”) After realizing that my knowledge of Russian only grazes the tip of the iceberg, I was discouraged at first, but I soon took heart when I began to see an increase in my vocabulary and understanding in the few short days I’ve been here. Maybe I don’t know anything right now, but I have all summer to improve! I hadn’t had contact with my parents in the whole time I’d been here, and I wanted to let them know that I hadn’t died, so I bought a phone card that would supposedly let me call home. It didn’t work on my phone, my host mom’s phone, or a friend’s phone. I was about to give up when a guy in my group’s host mom told me of a supermarket, Globus, with free Wi-Fi (which is about as easy to find in this city as persimmons). It was already 9:00 at night, but the sun doesn’t set in Vladimir until 11:00, so I decided to set out on my own and find this Globus. I got on the bus and everything went without a hitch. Or so I thought. At about 10:00, the terrible internet dropped my call and I decided to go wait by the bus stop. My call with Mom had been good, but short. I waited. And I waited. After fifteen minutes with no buses, I began to worry. The sky was light, but beginning to fill with the rainbow of sunset, and I knew that I needed to get home soon. I called my host mom, and she told me that buses stop coming to Globus after 10, and I would need to come home on foot. “Can you find the way, or do you want me to come meet you?” she asked. “Oh, I’m fine, I’ll find the way,” I said confidently. I shouldn’t have been so confident. After ten minutes of walking, I came to an intersection, and realized that I was lost. I called her again, and the imperfect Russian that I do have started to leave me. I was beginning to panic. “Stay there! I’ll come and meet you!” Tatiana, my sweet little host mom, assured me. After she hung up, I stood there awkwardly on the side of the road feeling like a little kid who got separated from his mommy in a grocery store. I felt embarrassed and bad that Tatiana had to leave her house at 11:00 to come find me, but I felt equally scared for my safety. I spent the fifteen minutes on the side of the road alternating between semi-panic attack and prayer, silent tears streaming down my face. And God definitely answered! After what seemed like an eternity, I saw Tatiana waving at me from across the busy street. Apparently Globus was much closer than I had realized! In a flurry of embarrassment and relief, I apologized to Tatiana for making her come all the way to get me. She didn’t show a sign of annoyance, but she gave me a motherly smile, told me it was okay and tried to make light conversation with me as we walked back to her ninth floor apartment. When we returned, she made me a steaming mug of tropical fruit flavored tea, which was exactly what I needed to calm down after my little ordeal. I have to say, I am already so extremely thankful for my host mom. She is one of the sweetest, most patient people, and I thank God for her kindness to me. So soon.In seventeen short days, I’ll return to that vast land whose name evokes memories of late night adventures and soul laughter and life at its fullest. I can’t wait to breathe deep the smells of cigarette smoke, late-night bonfires, hot tea, and incense. I can’t wait to hear again the constant dance of the Russian tongue, consonantal waltzes in my ears. I can’t wait for the challenge of moving past, beyond the shyness, the foreign identity, to grab hold of life in this language that He’s taught me to love. To step into heels and paint my hair dark and become the girl Nadia for a summer. I know I will be challenged, faced with the choice of either withdrawing into myself or fighting to live outwardly and to make the most of every opportunity. The first choice is easier, but stale, bland. The second choice is worth the exhaustion, the frustration, the awkwardness, the embarrassment. May I not forget that it is all worth it. When I have the choice of initiating conversation or retreating to my room, I will fight the inner voices of fear of imposition, of approval-craving, of not wanting to rock the boat, remembering that it is worth it. When faced with a need, a question, a confusion, I will risk embarrassment, I will risk being misunderstood, I will risk receiving a penetrating glare coupled with a scowl, because it is worth it. I will attend to my work, but I will not allow the ironic loss of learning that comes from a misplaced gaze on the books instead of the people, on grammatical structures instead of living language. I will give myself over to the joy in these people, in this place, that God lit in me that 12-year-old summer 9 long, fairy-tale years ago. And I will keep my eyes on Jesus Christ, the Author and Perfecter of my faith, counting challenges as joy, failures as harbingers of growth, and trials as a chance to delve deeper into His arms. All glory to Him, my Joy, my Rock, my Savior.